Cite page (MLA): "Illustrative Image Credits." Livingstone Online. Adrian S. Wisnicki and Megan Ward, dirs. University of Maryland Libraries, 2018. Web. http://livingstoneonline.org/uuid/node/906a2148-9b4b-4981-b5e7-82412ba8b4c2. This page provides the individual credits for the images used to illustrate our home page, the tiles on our six main section pages, and the carousel tiles that appear at the top of each content page. Third image - 'The Tsetse' (Livingstone 1857:frontispiece). Copyright Royal Geographical Society (with IBG). Used by permission for academic purposes only. For non-academic use permission, please contact the Picture Library. The Design of Livingstone Online - Stained-glass window (1932) on ground floor near exit at David Livingstone Centre museum, 2015. Copyright Angela Aliff. May not be reproduced without the express written consent of the National Trust for Scotland, on behalf of the Scottish National Memorial to David Livingstone Trust (David Livingstone Centre). Livingstone Online Site Guide - David Livingstone Centre: Children's activity based on 'Snakes & Ladders.' Copyright Angela Aliff. Image used by permission. May not be reproduced without the express written consent of the National Trust for Scotland, on behalf of the Scottish National Memorial to David Livingstone Trust (David Livingstone Centre). Who is Livingstone Online's Audience? - 'Livingstone Writing in His Journal' (Stanley 1872). Copyright David Livingstone Centre. Image used by permission. May not be reproduced without the express written consent of the National Trust for Scotland, on behalf of the Scottish National Memorial to David Livingstone Trust (David Livingstone Centre). A Brief History of Livingstone Online (2004-2013) - David Livingstone's surgical instruments in leather pouch, detail. Copyright Livingstone Online (Gary Li, photographer). May not be reproduced without the express written consent of the National Trust for Scotland, on behalf of the Scottish National Memorial to David Livingstone Trust (David Livingstone Centre). LEAP (2013-2016): A Project History, Part I - David Livingstone's compass. Copyright Livingstone Online. May not be reproduced without the express written consent of the National Trust for Scotland, on behalf of the Scottish National Memorial to David Livingstone Trust (David Livingstone Centre). Livingstone’s Missionary Travels Manuscript (1857) - John Murray III and Anon., David Livingstone - Boat Scene (Painted Magic Lantern Slide), , detail. Copyright National Library of Scotland. Creative Commons Share-alike 2.5 UK: Scotland. Browse by Location - David Livingstone, Map of Lakes Nyassa and Shirwa, [1864? ], detail. Copyright National Library of Scotland. Creative Commons Share-alike 2.5 UK: Scotland. As relevant, copyright Dr. Neil Imray Livingstone Wilson. Creative Commons Attribution-NonCommercial 3.0 Unported. The Livingstone Spectral Imaging Project: An Introduction - Kate Simpson preparing a page of Livingstone's 1871 Field Diary for spectral imaging, National Library of Scotland, 2010. Copyright Callum Bennetts - Maverick Photo Agency. Used by permission. Livingstone's Letter from Bambarre - Debbie Harrison examines a page of Livingstone's 1871 Field Diary, National Library of Scotland, 2010. Copyright Callum Bennetts - Maverick Photo Agency. Used by permission. Notes on Processed Spectral Images - Bill Christens-Barry (background) and Roger L. Easton, Jr. processing a page from Livingstone's 1870 Field Diary, National Library of Scotland, 2010. Copyright Callum Bennetts - Maverick Photo Agency. Used by permission. Southern Africans and the Advent of Colonialism - 'Fulfillment: The gift of the United Church of Canada.' Copyright Livingstone Online. May not be reproduced without the express written consent of the National Trust for Scotland, on behalf of the Scottish National Memorial to David Livingstone Trust (David Livingstone Centre). 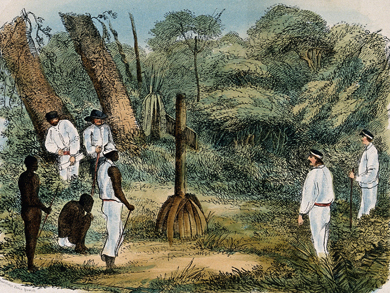 Practices, Standards, and Arrangements - 'The Tsetse' (Livingstone 1857:frontispiece). Copyright Royal Geographical Society (with IBG). Used by permission for academic purposes only. For non-academic use permission, please contact the Picture Library. Collaborating Institutions - David Livingstone, Map of Lakes Nyassa and Shirwa, [1864?]. Copyright National Library of Scotland: Creative Commons Share-alike 2.5 UK: Scotland, and Dr. Neil Imray Livingstone Wilson (as relevant): Creative Commons Attribution-NonCommercial 3.0 Unported. Credits and Permissions - Wooden spoons. Copyright Livingstone Online (Gary Li, photographer). May not be reproduced without the express written consent of the National Trust for Scotland, on behalf of the Scottish National Memorial to David Livingstone Trust (David Livingstone Centre). Livingstone Online Project Documents - Hilt of Livingstone's consular sword. Copyright Livingstone Online (Gary Li, photographer). May not be reproduced without the express written consent of the National Trust for Scotland, on behalf of the Scottish National Memorial to David Livingstone Trust (David Livingstone Centre). David Livingstone: A Bibliography - 'A Londa lady's mode of wearing the hair' (Livingstone 1857). Copyright Royal Geographical Society (with IBG). Used by permission for academic purposes only. For non-academic use permission, please contact the Picture Library. Livingstone Online TEI P5 Encoding Guidelines - Calabash water bottles. Copyright Livingstone Online (Gary Li, photographer). May not be reproduced without the express written consent of the National Trust for Scotland, on behalf of the Scottish National Memorial to David Livingstone Trust (David Livingstone Centre).